I have been talking about North Korea and mapping the country for over four years now, and a question people ask me fairly often is, 'what's the point?' My normal answers tend to revolve around my own inherent interest in the country and in mapping, however, there is a far more concrete value to this endeavor than simply satiating my curiosity. North Korea is more than just some rouge state hellbent on gaining nuclear weapons. It's a dynamic country with 25 million people, all of whom share a 2,100 year history with 50 million of their southern brethren. And, yes, they also have a deep military state that is always seeking ways to hide their more dangerous activities. And because of all of this, things change - and much remains unknown. Current collections of nation-wide data are years out of date and resources like Google Maps are often woefully inadequate. Because their military activities tend to get the outside world to pay attention more than anything, I think the best example of the benefits of the #AccessDPRK Mapping Project is to show how some of these military areas have drastically changed over the last decade. This image shows each of the 318 active anti-aircraft artillery batteries in Pyongyang. And this shows each of the 108 decommissioned artillery batteries in the area. Because of the reliance on older maps and information, just about every crowd-sourced mapping site (Wikimapia, Openstreet, etc) has these inactive places marked. Several of them have been completely demolished and turned into farm land but exists on maps as artillery sites! It's not just Pyongyang. I have located 386 decommissioned artillery sites all over North Korea, many of them, unfortunately, are on maps. Furthermore, of the 1,358 known active sites, some 500 aren't on any map. And speaking of the shared history of Korea, #AccessDPRK now has 346 ancient sites mapped - an increase of 119 new places found since my article on the subject back in February 2016. As far as I have been able to find, at least half of these sites aren't on any maps available online (or anywhere else that I can find). This doesn't include hundreds of centuries old burial mounds and tombs either. Furthermore, the project will also allow people to see some of the tremendous natural changes that have occurred, like an enormous landslide in the ecologically important Mt. Chilbo National Park, or the damage done in recent flooding. It would be difficult to detail every value of a map with over 50,000 places marked, but I hope I've adequately expressed the point of this effort. There's a massive underground complex hidden away in the hills of North Korea. For years it has laid dormant (as far as one can tell), that is until recently. The facility at Hagap (40° 04′ 48″ N, 126° 10′ 56″ E), is a suspected underground nuclear site, either to store material or produce it. 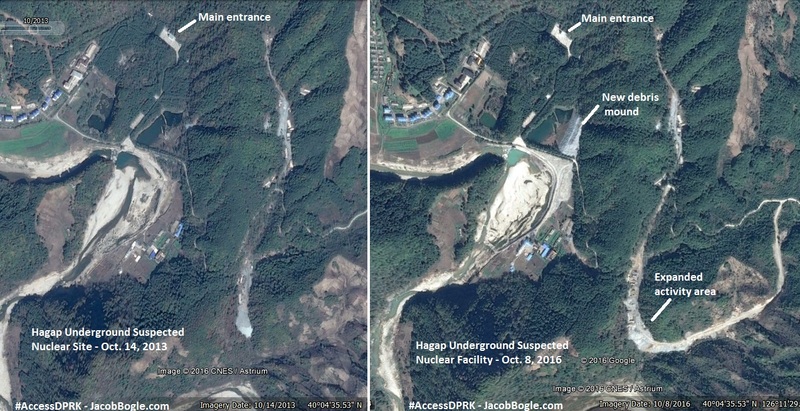 According to Dr. Jeffery Lewis, at Armscontrolwonk.com, the site became publicly known in 1998 (the US government knew about it since 1996) and was constructed at the same time as another underground site, Kumchangni (40° 7' 8 "N 125° 8' 32"E). Since such a site could possibly violate the bilateral 1994 Agreed Framework, North Korea didn't say a word about the place. After the site became public, the US managed to send a delegation to visit it. They didn't find much besides an oddly designed underground facility. The debate about what exactly is going on at Hagap continues to this day. It has been speculated that the site is used for nuclear materials storage, centrifuge production, or even just a large secure warehouse for archival materials. However, the connection with Kumchangni still remains. There is a third site too, at Yeongjeo-ri (Ryanggang Province), but little is known about it. North Korea's nuclear program has been ramping up since the final days of Kim Jong-il, and Kim Jong Un seems to be increasing that pace. In the light of that, it is disconcerting to see fairly substantial new activity happening at Hagap. At the site you can see a large mound of new rock debris which has been piled up in the pond below the main entrance. You can also see an increase in the number of small buildings and debris that are in the small valley. This one shows the debris mound. This image shows the extended activity area with new buildings. There is also an odd collection of towers nearby. They look like electrical transmission pylons, but are clustered together into three groups. There are no visible power lines either. It's possible these were laid out when Hagap was originally constructed to provide power, but haven't been needed since the site was largely abandoned. Or they could be some kind of radar/communication array. The towers are located around a bend in a river with small hills on either side, those hills have an anti-aircraft artillery battery stationed on each one. If you'd like to study the area further, it can be found here 40° 4' 50"N 126° 6' 35"E.
UPDATE: These have been confirmed as emergency parking positions for jets, since highways can be used as auxiliary airfields (and North Korea does have at least 14 official "emergency highway strips"). On the heels of Kim Jong-un suggesting that the country is very close to testing another ICBM, I've discovered three sites that could be used as dedicated mobile-missile-launcher pads. These sites were constructed in 2016 and have the same general design. The first and largest is near Kaesong and lies less than 10 miles (16 km) from the Demilitarized Zone with South Korea. Located adjacent to the Pyongyang-Kaesong Highway, by the village of Haeson-ri, this site was under construction in March and had been completed by October 2016. Each pad is 45 feet (14 meters) wide and the straight portion is 175 feet (53 meters) long. The area around it also contains numerous bunkers and tunnels. The second site is in Pyongsong, South Pyongan Province, which is 21 miles (34 km) north-northeast of the center of Pyongyang. Just like the Kaesong site, this one is located adjacent to a main highway. In this case, National Highway 65. The area also has a high concentration of HARTS (Hardened ARTillery Sites), which are marked by the red dots. Several additional military facilities are also nearby. Lastly, the third site is similar in its size and the fact it's right off a highway, but its design is different. The primary difference is a lack of a central berm. This site is located near Sukchon, also on South Pyongan. If these are indeed dedicated pads for launching missiles, it would be in line with North Korea's continued modernization and expansion of their offensive capabilities. I'd like to make a quick note about the #AccessDPRK Mapping Project. Across North Korea, I have located 9,500 military related places. I have finished the primary mapping process and am now working on incorporating the work of two others into a main and comprehensive single file. After that, the entire body of work will be published.